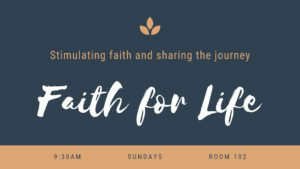 Faith for Life Adult Bible Fellowship exists as a diverse community of worshipers, unified by faith in Christ, committed to sharing life experiences together. FFL values the varying background, age, family status, ethnicity, and life experiences that each person brings to the group and draws upon the unity of our faith in Jesus Christ as a basis for our friendship and care for one another. We recognize the strength in learning from each other in all facets of life while collectively submitting ourselves to God’s Word.